- NWA 53rd Anniversary Show (October 13, '01) = Lovett lost the NWA World Junior Heavyweight Title to Jason Rumble in a "Fatal Five-Way" Match. The other participants were Jimmy Rave, BJ Turner, and Brandon K. Later that night, Team NWA Florida (Lovett, Buck Q, Rod Steel, Chris Nelson, & Vito DeNucci) fought to a No-Contest in a "Wargames" Match with Team IPW (Scoot Andrews, Mike Sullivan, Jet Jaguar, Chaos, & the Shane Brothers). - NWA-TNA PPV (Show #30, February 5, '03) = In a dark match, Lovett & Rod Steel fell to David Young & Tony Mamaluke. - NWA-TNA Against All Odds (February 13, '05) = In a dark match, Lovett & Buck Quartermain were beaten by Phi Delta Slam. 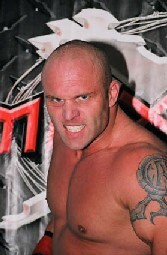 - NWA-TNA Destination X (March 13, '05) = In a dark match, Lovett & Buck Quartermain lost to Chris Candido & Andy Douglas. - NWA-TNA Lockdown (April 24, '05) = In a dark match, Lovett & David Young lost a "Three Way" Match to 3 Live Kru (Killings & Konnan). The Naturals were the other participants. - DSW Tag-Team Title Tournament (May '06) = Lovett & Gymini Jake defeated Eric Perez & Montel Vontavious Porter, then fell in the finals to High Impact.